What Is DA Form 285-AB? 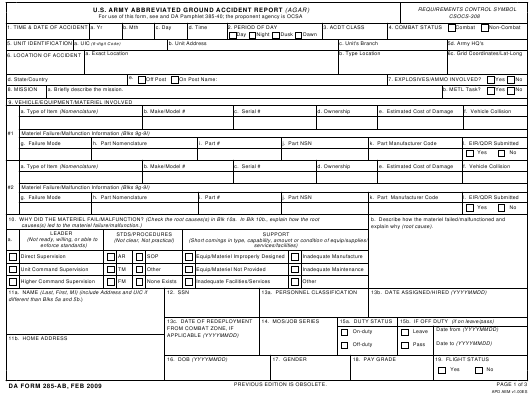 DA Form 285-AB, U.S. Army Abbreviated Ground Accident Report (AGAR) is a three-page form used for reporting ground accidents within the U.S. Army that range from Class C to Class E. Being an abbreviated report, the AGAR also serves to reduce reporting requirements. All accidents regardless of accident class or personnel duty status must be reported to the local safety office and to the immediate commander or supervisor whose operation, personnel, or equipment is involved. The form - sometimes confused with the DD Form 285, Appointment of Military Postal Clerk, Unit Mail Clerk or Mail Orderly - was last updated by the Department of the Army (DA) in February 2009. An up-to-date DA Form 285-AB fillable version is available for digital filing and download below or can be found through the Army Publishing Directorate (APD) website. How To Fill Out Da Form 285-ab? a. Briefly describe the mission. ACTIVITY OF INDIVIDUAL Provide code (from list in instructions) and describe in space below. 22a. OSHA Log 300 Case No. 27. EQUIP THIS PERSON WAS ASSOCIATED WITH? DOT Approved (if Motorcycle) ? (from instructions) in Blk b and describe in Blk c.
c. Tell what the mistake was and how it caused/contributed to the accident or severity of injury/damage. 37b. Describe root cause(s) (reason) and tell how it/they caused the mistake. 38. PARACHUTE INFORMATION FOR PERSON LISTED IN Blk 11. One complete form is required is required for every involved individual. If more than one person is involved in the accident, an additional form should be filed for each individual with only Blocks 1 through 5 and Blocks 9 through 37 completed. Any person that was injured in the accident or took actions that caused or contributed to the accident is considered involved. Block 1 is for the date and time of the accident. Block 2 is for the period of the day the accident took place. The class of the accident is entered in Block 3. Block 4 is used to specify whether the accident occurred during combat or not. Block 5 is for identification of the unit associated with the accident. The location of the accident is provided in Block 6. Block 7 is filled out if any explosives, ammunition, or pyrotechnics were involved. Block 8 requires the description of the mission associated with the accident. Block 9 should contain a description of the vehicles, equipment or materials damaged in the accident. The reasons for the equipment failure or malfunction should be described in Block 10. Blocks 11 through 19 are for the information about the individual involved. Block 20 is for describing the damage taken. Time lost due to the accident is provided in Block 21 (in days). Block 22 requires an OSHA Log 300 case number, the name of the physician and the location of treatment if the treatment was provided away from the worksite. Block 23 is for the code of the activity performed during the accident. A specific description of the activity is given in Block 24. Block 25 is for specifying what protective equipment was available or used during the accident. Block 26 is for specifying if alcohol or drugs were involved in the accident. The equipment the individual involved was associated with is specified in Block 27. Block 28 is for specifying whether the individual involved had traffic safety training, an MSF certificate and a license required to operate the vehicle or equipment. Duty hours are entered in Block 29. Hours of sleep are entered in Block 30. Block 31 is filled out if the accident happened during tactical training. The type of training facility is specified in Block 32. Block 33 is for the information about the training. Block 34 requires specifying if the training included field exercises or operations. The use of night vision systems is disclosed in Block 35. Blocks 36 and 37 are filled out if the accident was a direct result of the actions of the individual involved. Block 38 should be completed if the accident occurred during parachuting. Environmental conditions are described in Block 39. A brief synopsis of the accident should be provided in Block 40. All actions taken, planned or recommended to eliminate or reduce the root cause of the accident should be described in Block 41. Block 42 should be completed if Block 7 was answered positively. Blocks 43 and 45 are for electing a point of contact for everything accident-related and for providing information about the Command review and Safety office review. DA Form 285, Technical Report of U.S. Army Ground Accident is a form used for reporting any ground accidents that happen on U.S. Army grounds. DA Form 285-A, Technical Report of U.S. Army Ground Accident Index A is a form used for reporting Class A ground accidents. DA Form 285-B, Technical Report of U.S. Army Ground Accident Index B is a form used for reporting Class B accidents. DA Form 285-O, Technical Report of U.S. Army Ground Accident Statement of Reviewing Officials contains a statement of the officials authorized to record the details of the accident. DA Form 285-W, Technical Report of U.S. Army Ground Accident Summary of Witness Interview is a form that serves as a record of interviews with the witnesses of the accidents.